Mariah Carey is an American singer, songwriter, record producer, and actress, from Huntington, New York. She has sold over 200 million records during her career, which automatically makes her one of the best-selling music artist of all time. Mariah is one of the richest, and most popular singers in the world, after rising to fame in the early 1990’s. As of 2019, Mariah Carey’s net worth is an incredible $300 million. Mariah Carey was born on the 27th March 1969, in Huntington, New York. Her mother used to be an opera singer and vocal coach. When her mother, Patricia, married her father, Alfred; Patricia’s family disowned her for marrying a black man. From an early age, Carey showed great signs of creative talent. The only real subjects she enjoyed at school were art, music, and literature. She enjoyed singing and began writing poems and adding melodies to them. This sparked her initial pursuit as a singer-songwriter. Whilst Carey started writing songs, she was living in Manhattan with four female students, and was waitressing to pay the bills. She finally managed to record her own demo tape but failed in trying to pass it on successfully to record labels. Shortly after recording to demo, Mariah was introduced to pop singer Brenda Starr. As Brenda and Mariah became friends, she was very keen on helping Mariah succeed in the industry. Starr presented Carey’s demo tape to the head of Columbia Records, and he immediately signed Mariah after listening to the tape. Since then, her music has become some of the most popular of all time, and each one of her albums has achieved major success. 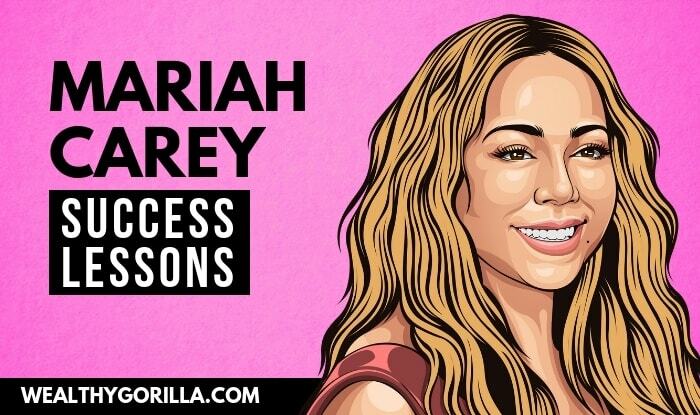 View our larger collection of the best Mariah Carey quotes! The first time, for me, that I actually felt it, was when I was six years old, and I was walkin’ down the street, with this little girl, and we’re singin’ at the same time, and then she stopped singing, and she started listening to me. Every time I hear one of my songs on the radio, I sit there, and say, okay now, I should have sung that line like this, and done that line like that, or, oh that’s rancid, or whatever, ’cause I’m just never satisfied with my work. I always feel like I could’ve done, I could have done it just a little bit differently, I feel that, for a first effort, I’m proud of it, and I’m just looking forward to completing the writing that I’m doing for my second album right now and make the best album that I can, and just look ahead, and not look behind. Well, I mean, I don’t want to encourage anybody in that, to go to school, or anything, you know. Far away from me, but, I liked school. I was more social in school than I was a student, and I always knew I was going to be a singer. That’s my thing. I’m very lucky that I am, ’cause right now, who knows what I’d be doing. But, I don’t know, I had trouble getting up in the morning, that’s why. Mariah Carey’s net worth of $300 million is very explainable, considering she’s managed to rack up a whopping 200 million record sales since the start of her career. Numbers like that definitely don’t come without a very large paycheck. What do you think about Mariah Carey’s net worth? Leave a comment below.